From backyards to schoolyards to prison yards, the chance to grow and eat natural, healthy food brings communities together and creates leadership opportunities for people from every background. That’s why Growing Gardens, an Oregon-based nonprofit founded in 1996, is committed to creating and leading gardening education programs throughout the state. 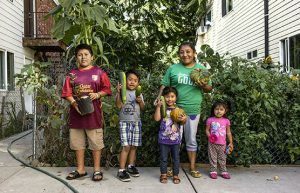 Growing Gardens started as a home gardening project for low-income families in Portland, with the intention of building raised garden beds in their backyards to increase access to healthy produce. It has since flowered into an influential local nonprofit utilizing gardens and gardening education to empower communities; mentor students, families, and inmates; and help underscore the importance of healthy eating. The organization’s staff and volunteers help facilitate neighborhood-based leadership and community building; serve diverse communities with culturally relevant, accessible programming and resources; and partner regionally to expand gardening education and support. Through partnerships with schools, 16 correctional facilities, and individual residents of the Rose City, Growing Gardens supports participants who commit to a minimum three-year program to learn the complete ins and outs of gardening in the Pacific Northwest. In 2017, The Portland Clinic Foundation awarded Growing Gardens an unrestricted $2,000 grant. The funding allowed Growing Gardens to hire a consultant to help build a culture of philanthropy within the organization, training the staff on the importance of fundraising and on how to represent themselves among donors, participants and volunteers. The training will help Growing Gardens grow sustainably and serve more communities, while maintaining financial stability. There are many ways people can support Growing Gardens, from helping install its 70 to 90 gardens a year to participating in the Spring Dig-In or fall’s Dawn of the Bed festivities. The organization’s Chef in My Garden fundraising dinners held in July and August, pair top chefs with outstanding wineries all held in private gardens across the city. Additionally, Growing Gardens is on the lookout for garden mentors who will work with homeowners, as well as volunteers for programs in correctional facilities. Skipton requests that volunteers commit to at least one year of service, whether or not they have experience in gardening. Growing Gardens has asked for The Portland Clinic Foundation’s help in preparing for spring plantings! Please bring new kid-size gardening gloves, organic/non-GMO seeds, and hand tools (trowels, etc.) to your local Portland Clinic office. Collection boxes will be located at all Portland Clinic branches from April 9th – the morning of April 20th. Help grow healthy kids and families by bringing in gardening supplies today! If you would like to help The Portland Clinic Foundation support nonprofit organizations like Growing Gardens, please consider donating today. Giving is easy: you can donate online, send in a check, include TPCF in your estate plans or, if you are a TPC employee, set up a payroll deduction. To learn more, visit www.theportlandclinic.com/foundation or call 503.221.0161 x2154. Your generosity and vision make our work possible. Thank you for all that you are doing to advance community wellness for all Portlanders!